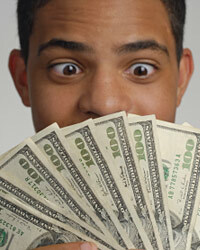 A $1,000 cash advance will likely have very high interest rates. Cash advances are typically only taken out when borrowers have little options to secure a different loan structure and are in desperate need of cash. Taking advantage of this desperation, the lenders will assume much higher rates than would be typical on a lower-risk loan. Not only are the interest rates on the cash advance likely to be high, there will also be very large penalties if you cannot repay the $1,000 immediately. Unlike personal loans, cash advances typically come due all at once instead of in installments. You will have to fork over the entire $1,000 sum plus interest within an average of 30 to 60 days. If not, you will have to pay a huge penalty. Instead of taking a cash advance, use a credit card where possible. Even credit card rates that are very high will be lower than cash advance rates. You will also have more flexibility in repaying these loans. If you do not have a credit card or need cash instead, it is better to borrow from a friend or family member than to seek a cash advance as large as $1,000.